A MELBOURNE lawyer who became seriously ill while hiking on the Kokoda Trail was guarded by a witch doctor in a remote Papua New Guinea village until she was rescued by the US Navy. Debra Paver had seizures and fell into a coma on the trail last week. At the request of the US embassy in Port Moresby, a helicopter was sent on Friday from the ship. The helicopter landed on a small patch of land in the mountains in thick fog at 1800 metres. 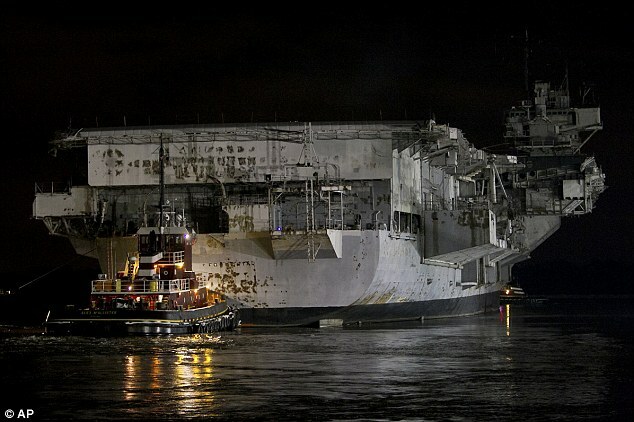 Ms Paver, 44, of Brighton East, was flown to the USNS Mercy and admitted to the intensive care unit where she began to recover from hyponatremia, low sodium levels in the blood. Join the Navy, see the world. Provide material support to Papua New Guinian witch doctors. Some guys will do anything for a little liberty. Update: As Sim points out in comments, the Mercy’s CO has his own blog and talks about the event. Cool. Perspicacious readers will have by now noted that your hosts store of “there I was” stories of naval derring-do have, well: diminished. Either through the telling, distance or the egregious assaults made by father time upon our brain cells. So we’re offering up a guest posting position to one Whisper, active FA-18 pilot and patriot. See how that goes. So without further ado, here y’are. 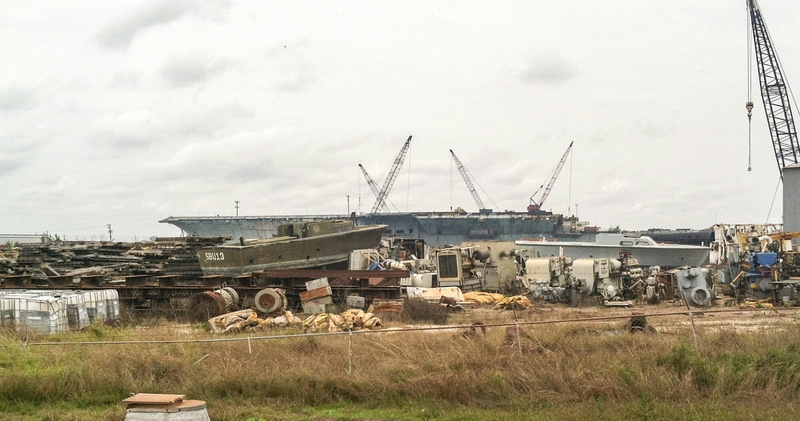 It is where ships go to die. 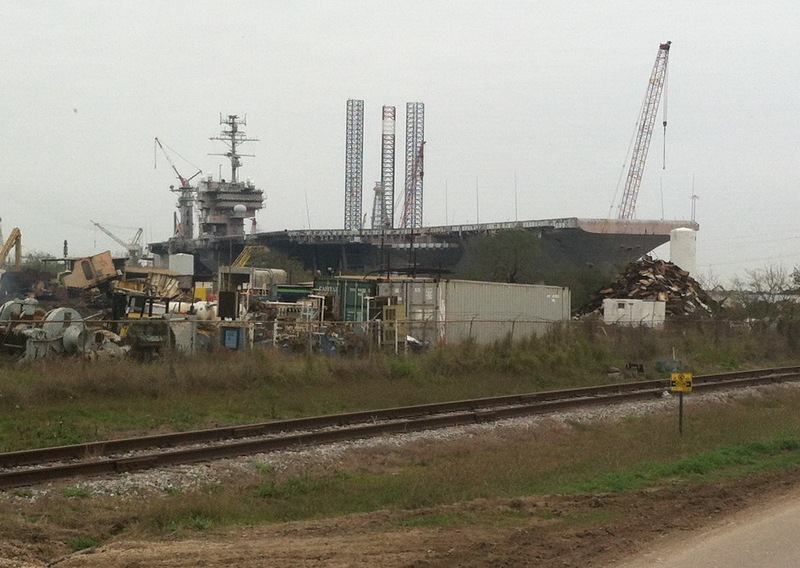 Forrestal and Saratoga are unrecognizable. Constellation arrived a couple of weeks ago. The three Good Ships I made cruises on are in the queue. Independence, Ranger and Kitty Hawk. Old friends they are to so many who chose the sea. The times are indeed, a changing. “Goldie, how many times have I told you guys that I don’t want no horsin’ around on the airplane?” The words came from B-52 Aircraft Commander Major Kong in the dark movie Dr. Strangelove in response to being apprised by Lt. Goldie, his radio operator, that Wing Attack Plan R for Romeo was in effect. Nuclear war with the Rooskies. Slim Pickens (Major Kong) and his crew get ready to go toe to toe with nukes. And before they can be recalled the CRM 114 radio that should receive the message calling off the attack destroys itself, and Major Kong’s crew becomes the opening act to World War III. Having served in Independence and Ranger, this does tug at the heart strings a bit. I did serve in those years with men who were aboard Forrestal during the tragedy of 1967. 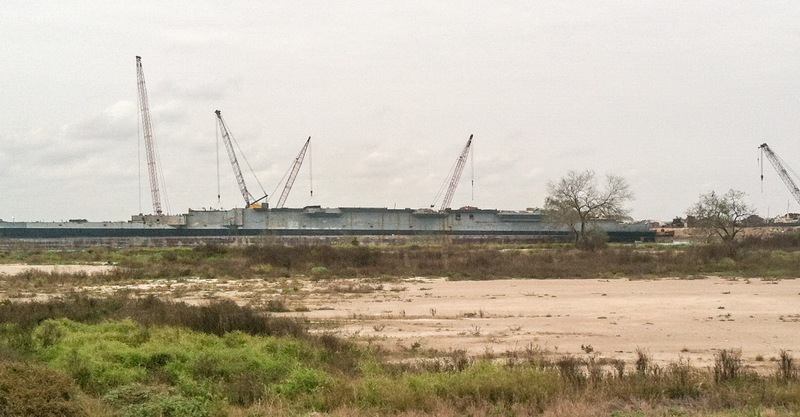 The Navy has paid one cent under a contract to have the 60-year-old vessel dismantled by All Star Metals in the Gulf port of Brownsville. This volume is not the official operational history. Strictly speaking, it is not a history, nor is it to be studied as such. Herein, in the narrative form, the reader will the inspiring saga of submarining. For the student, the technical side is featured. 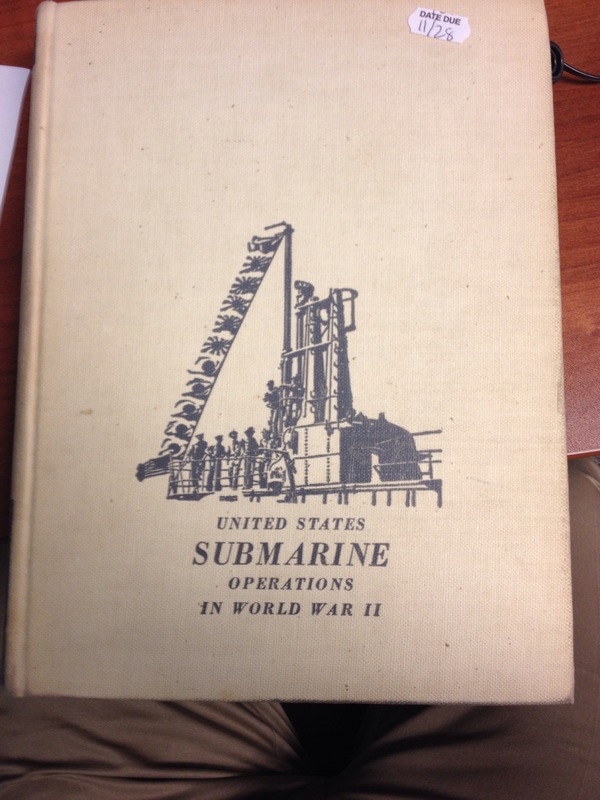 And many aspects of submarine warfare which would ordinarily be excluded from a purely historical text are detailed and discussed. It’s in my care for now, on loan from the Pritzker Military Library. I wanted to see if there are historical parallels between the sub campaign in the pacific to seeing how reasonable it would be to use SSNs/SSKs to contain the PLAN within the first island chain. 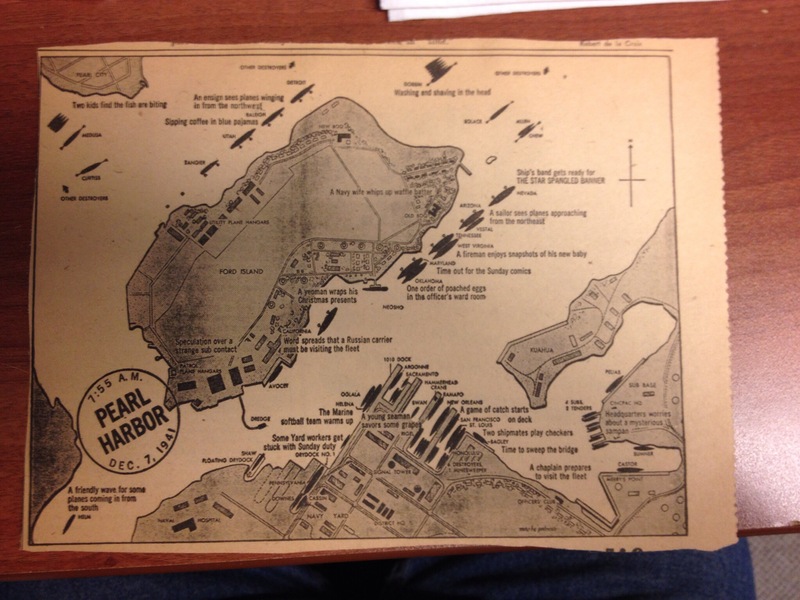 It’s an unknown newspaper clipping detailing the moorings of Pearl Harbor on the morning of December 7, 1941 at 7:55am. 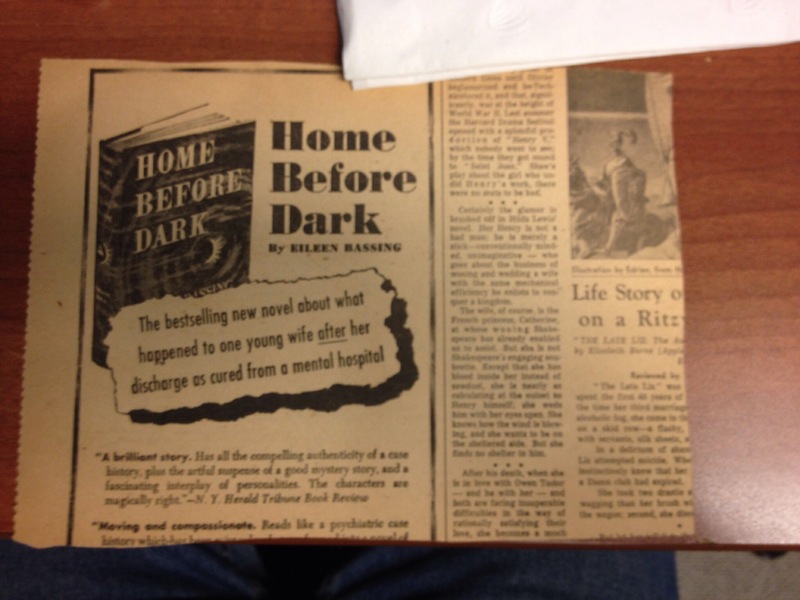 The other side of the clipping features an ad for a book called “Home Before Dark” by Eileen Bassing. According to a quick Google search it was first published in 1957. That leads me to believe the map and newspaper were published in 1957. The map itself is very interesting as it details most of the ships in port and even tells I what some witnesses were doing moments before the attack. Even more unusual, the paper left a stain on the page which makes me believe maybe it hasn’t been seen since 1957. Who knows. Anyway, this is a treasure map and maybe, if the reader know more than I, of some historical significance. Just amazing…you never know what you’re going to in and on these books. All carrier aviators have a story or two to tell, and I have a tale of working the carrier at night to offer. I am a little bit reluctant to pass on some of my stories because of the fear of honking my own horn. On the other hand, if the tales aren’t told, what will be left in the passdown log for generations to come?